Her music inspires a deep sense of intimacy, yet her fierce privacy is the key to her genius. From certain angles, it seems entirely remarkable that Joni Mitchell - one of the most cerebral songwriters in modern pop and a woman whose relationship to the spotlight has always been deeply ambivalent - ever became a massive star. From other angles, her ascension seems inevitable. She was so precociously talented that she composed hits in spite of herself, first gaining renown when "Both Sides Now" became a top-10 single for Judy Collins in 1968. Mitchell, who was 25 years old, had only just released her first record. Two years later, her third album, Ladies of the Canyon, closed with the troika of "Big Yellow Taxi," "Woodstock," and "The Circle Game," three of the most iconic songs of a generation, rattled off almost as an afterthought. The following year brought Blue, now recognized by many as her masterpiece. This summer - almost half a century later - Blue topped NPR Music's list of "The 150 Greatest Albums Made by Women," compiled by a panel of nearly 50 contributors. "Blue remains the clearest and most animated musical map to the new world that women traced, sometimes invisibly, within their daily lives in the aftermath of the utopian, dream-crushing 1960s," wrote the NPR music critic Ann Powers, who helped conceive the top-150 project. Powers called attention to the discomfiting audacity of Mitchell's creation: "It is a record full of love songs, of sad songs; but more than that, it is a compendium of reasonable demands that too many men in too many women's lives heard, in 1971, as pipe dreams or outrageous follies." Indeed, upon its release, Blue - an abrupt turn away from the counterculture-soaked Ladies and toward something both more personal and more elusive - was met with confusion in many quarters. It would not be the last of Mitchell's releases to provoke such a response. By the mid-'70s, her compositions had grown so complex that she was performing almost exclusively with jazz musicians. L.A.'s rock session players were no longer able to figure out her chords. Among Mitchell's greatest gifts is her ability to create a sense of connection with her audience. Trying to write about her music proved only slightly less difficult than trying to play it. Mitchell was a songwriter and a performer who prompted her audience to fantasize about some sort of personal access to her even as her art itself grew ever more challenging and rarefied. Nearly 50 years' worth of critical efforts to solve Mitchell's mysteries have now been rounded up in Barney Hoskyns's Joni: The Anthology. The first major collection of previously published writing on the singer has its quirks and gaps (and a distinctly British flavor). But what comes through most consistently is a possessive impulse, a desire to really know an artist whose fierce privacy has often seemed at odds with the impression of intimacy conveyed by her music. Mitchell's most ambitious songs were impervious to musical comparison or reference, the staples of workaday rock criticism. So instead, people (mostly male people) wrote about her, or their ideas of her, mining her lyrics for nuggets of confession and gossiping about her personal life. A generation of rock men, assuming for themselves the role of authorities in the genre, tended to view Mitchell primarily as an object - of desire, of curiosity, of worship, of derision. Stephen Stills once told the journalist Ellen Sander that "every man within fifty feet falls in love with her." Among Mitchell's greatest gifts as a songwriter and a performer was a double-edged one: her preternatural ability to create a sense of connection with her audience. Male listeners, believing they were in love with her, also indulged the illusion that she might love them. Female listeners believed she was giving voice to their own lives and thoughts. Her dazzling powers of expression, in her writing and in a pristine soprano that seemed to exude confessional directness, had a way of obscuring the sophistication and intellect that defined her art. Particularly in her early years, Mitchell seemed to represent for her audience an ideal of human companionship - lover, friend, confidant, teacher. She was, to use one of contemporary English's worst words, relatable. Yet whatever her listeners might dream or desire, Joni Mitchell was never in it for them, and she certainly wasn't like them: She was a genius. As David Yaffe shows in his new biography, Reckless Daughter: A Portrait of Joni Mitchell, to approach her as an open book waiting to be read is to miss the essence of that genius. In the best full-length treatment of Mitchell yet published, Yaffe follows her from her childhood in postwar Saskatchewan all the way up to a Chick Corea concert last year, her first public appearance after suffering an aneurysm in 2015. 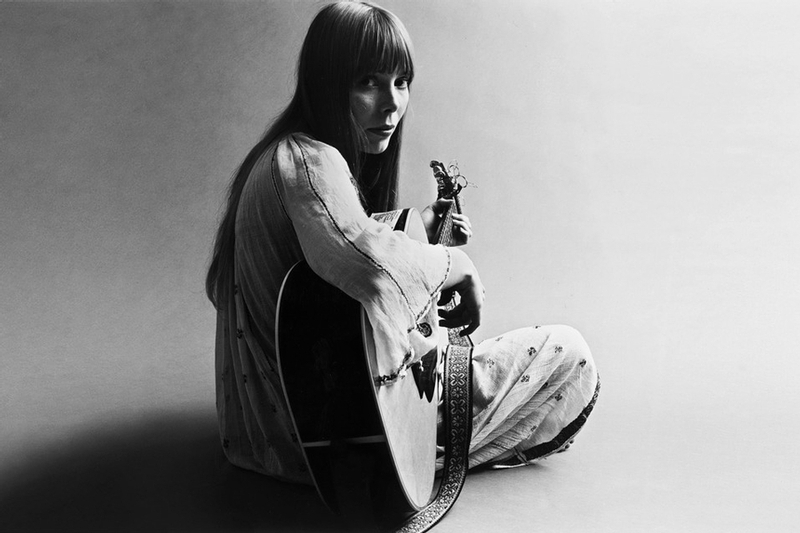 Yaffe was granted extraordinary access to the famously standoffish Mitchell, as well as to many of her closest friends and collaborators, including Wayne Shorter, Herbie Hancock, Joan Baez, David Crosby, Judy Collins, and the late Leonard Cohen. Making the most of his proximity, he pulls off the feat that has eluded so many of his predecessors: He forges an intimacy with Mitchell on her own, uncompromising terms by truly listening to her, as closely and as generously as she's always deserved. Yaffe, a humanities professor at Syracuse University, is a self-professed Mitchell obsessive. He writes with the passion of a fan, but his book is neither a hagiography nor a kiss-and-tell-all. Occasionally his closeness to his subject seems to tempt him to overpsychologize, and some may find his habit of calling his subject "Joni" distracting, but given the amount of time he spent with her, it doesn't feel unearned. And Yaffe never tries to present Mitchell as a straightforwardly cooperative subject. He wisely presumed the contrary, as he makes clear from the start. He opens with a story of being chewed out by her in 2007 for using a particular adjective - middle class - to describe her home in a profile he wrote of her for The New York Times. As he appreciates, her problem wasn't just that she found it unflattering, but that she deemed it imprecise. (Earthy would have suited her better.) Plus, she didn't regret the friction, as she admits to him later: "I'm so easy to win back. But if there's no meeting and no communication and the vibe is cold, what can you do?" Talking about music, like writing about it, is remarkably difficult, and most musicians aren't much better at it than the rest of us. Mitchell is the rare artist whose description of her work and creative process can enhance our understanding, not in a literal-minded way but in a sort of metacritical one. "Joni's songs taunt listeners into biographical readings," Yaffe writes, "and they also invite us to understand the mind creating them." In Reckless Daughter, he draws out that mind as it dances from humor to introspection to prickliness to profundity. Blue wasn't mitchell's biggest hit (that turned out to be 1974's Court and Spark), nor was it her most musically ambitious work (next to her late-'70s output, it sounds studiously minimalist). But it's the album that has most seductively metonymized the singer in the minds of fans and critics in the decades since its release. It is one of the most viscerally intimate pop albums ever recorded, an effect achieved not merely through its lyrical content but through its entire sonic form. Blue's signature sound, heard in the opening notes of the album's first track, "All I Want," is made by an Appalachian dulcimer. Mitchell once described her emotional state during the period she was working on Blue as "like a cellophane wrapper on a pack of cigarettes," a condition that the dulcimer puts to sound, all sparkling, brittle fragility. The album features "Little Green," Mitchell's love song to a daughter she'd given up for adoption at age 21, as well as "A Case of You," perhaps the most romantic song in Mitchell's entire catalog. The album also includes "River," which became one of Mitchell's most popular compositions. (According to Yaffe, it has been covered more than 500 times.) From its opening reharmonization of "Jingle Bells" to its unflinching depiction of a relationship in winter, "River" is a perfect song. "I wish I had a river so long / I would teach my feet to fly," Mitchell sings, elongating and soaring upward on that last word, only to finally settle back to Earth on the brutal line "I made my baby cry," sung in a descending major scale, which is among the most elemental melodies in Western music. "River" is a microcosm of Mitchell's compositional gifts, its words and melody and harmonic progression so exquisitely interlaced that discerning which generated which is impossible. Its fate is also a microcosm of the confused reception accorded Mitchell's music in the broader culture. "River" is now a staple of holiday radio and movie soundtracks, its ubiquity drowning out its truth: "River" is a song about people being terrible to each other. I came to another turning point - that terrible opportunity that people are given in their lives. The day that they discover to the tips of their toes that they're assholes (solemn moment, then a gale of laughter). And you have to work on from there. And decide what your values are. Which parts of you are no longer really necessary. They belong to childhood's end. Blue really was a turning point in a lot of ways. As Yaffe puts it, "With these songs, a cycle on the perils and pleasures of love and its discontents, Joni offers her own battered heart for anyone else who has dared to be vulnerable and survived the wreckage." Yet her offering was anything but simple, and with one word, cycle, he points to the ambition of Mitchell's musical and emotional endeavor. Her songs - entwined with one another without being constrained - evoke evanescence, but also endurance, and tell a universal story in vividly particular terms that could only be her own. Yaffe's greatest accomplishment in Reckless Daughter, stuffed though it is with insightful reporting, is to shed light not just on the artist but also on the art. Yaffe (the author of two previous books, Fascinating Rhythm: Reading Jazz in American Writing and Bob Dylan: Like a Complete Unknown) brings a sophisticated and exceptionally careful ear to music that demands nothing less. A detailed analysis of the title track on Court and Spark links the song's harmonic structure to Debussy's "Clair de Lune" - a piece that Mitchell adored as a child in Canada. Such moments are what the very best biographies of artists strive for. Yaffe's exegeses take flight again and again. Read him on Blue's "All I Want" - "Like eros itself," he observes, "perpetually incomplete, but searching for completion anyway" - and the song will never sound the same. As the '70s progressed, the tension between Mitchell's genius and her audience's expectations grew more fraught. The Hissing of Summer Lawns (1975), her follow-up to the multiplatinum Court and Spark and her boldest foray yet into the avant-garde borderlands of jazz, was dismissed by Rolling Stone as "a great collection of pop poems with a distracting soundtrack." (It's now considered a stellar achievement - Prince cited it as one of his favorite albums of all time.) Reckless Daughter also offers an overdue reconsideration of the most controversial entry in Mitchell's catalog, Mingus, her collaboration in 1978 with the dying jazz great Charles Mingus, a partnership that she considered almost sacred - and that nearly destroyed her career. Mitchell turns 74 this month, and may or may not make music again. She will almost certainly never seek out the Boomer-in-winter adulation that has proved so lucrative for many of her contemporaries. Nor does she need to. Her influence on popular music is staggering, heard in artists ranging from Taylor Swift to Frank Ocean to James Blake to Lorde. And it is only growing. "I am a lonely painter / I live in a box of paints," Mitchell sang in "A Case of You" nearly 50 years ago. The box is still hers, but today we all live there. This article has been viewed 61,152 times since being added on October 4, 2017.